One of several towering temples at Tikal. 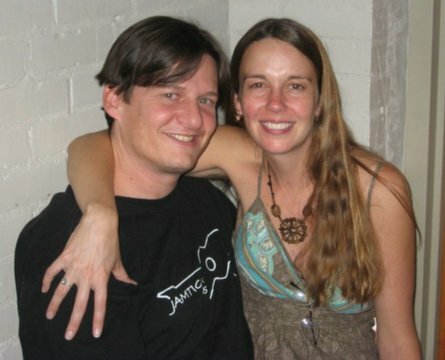 This photo was taken from near the top of a similar temple. - It was continuously occupied for around 1800 years (from 900BC to 900AD), or almost 8 times longer than the U.S. has been a country, and more than 3 times longer than the amount of time that white people have known of the existence of what is now known as "America"
- After it was re-discovered in the 1700s, it remained virtually unreachable for a couple of centuries. 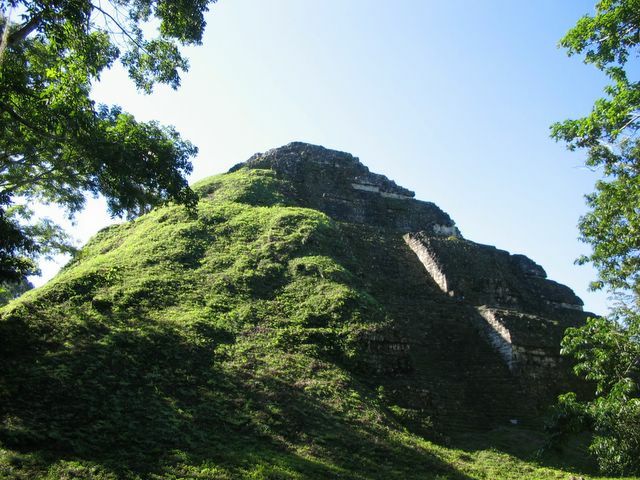 Due to its remoteness in the vast jungle, archaeologists had to travel for days on foot or by mule to get there. Finally in the early 1950s, an airport was constructed nearby, and the ruins were converted to a National Park. 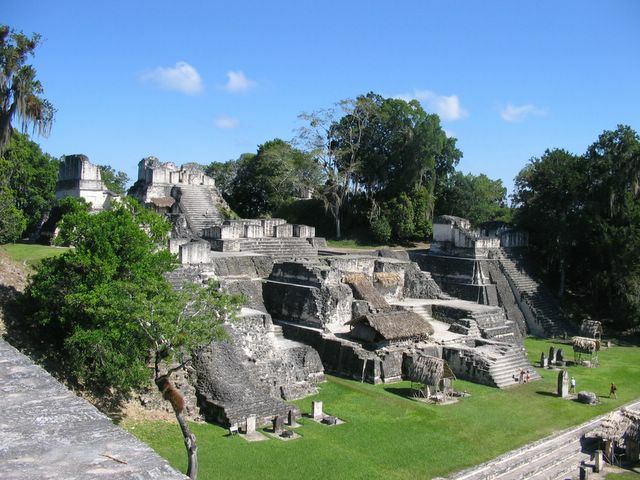 One thing to keep in mind about Tikal is, it’s just one site out of about a dozen large ancient Mayan cities that are spread throughout the tropical lowlands of Petén. 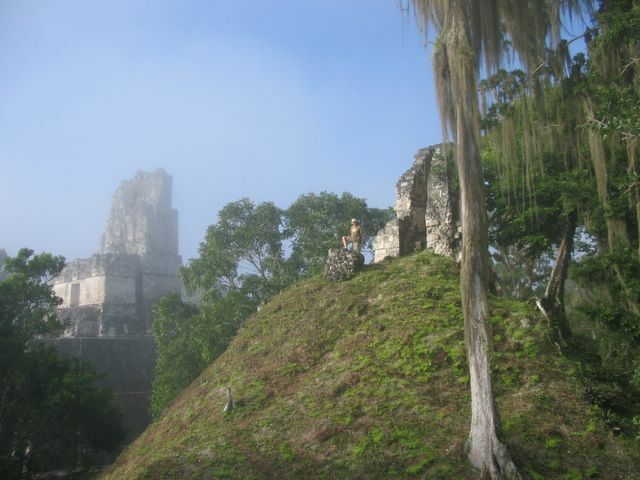 There are several more ancient cities in the jungles of neighboring Belize and Mexico. A millennium-and-a-half ago, these cities formed a vast network of alliances and enemies that constantly traded with each other when they weren’t fighting wars. 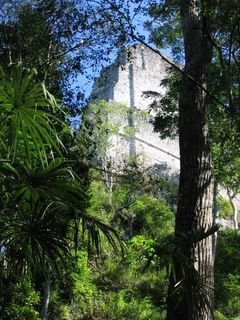 After the mysterious collapse of the civilization in the 10th century, the cities were abandoned and the descendants of the Maya resettled in the western mountains of the region, mixed with other indigenous groups, and splintered into several dozen groupings that still exist today, each speaking their own language. 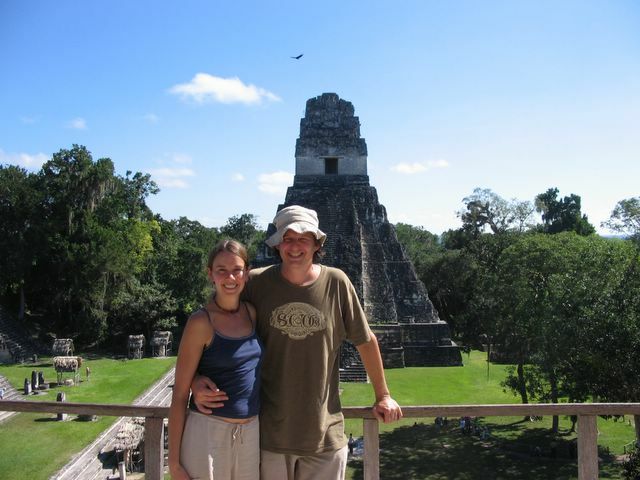 Today the descendants of the Maya still constitute more than half of the population of Guatemala. We arrived early in the morning before the fog had lifted, which made the experience all the more ethereal. One reason we arrived early was to encounter more wildlife, since the ruins are surrounded by a thick, vast jungle. While we didn't see any toucans or parrots, we did see (and HEAR) some howler monkeys. About the size of a dog, they sound more like lions! We couldn't get a good picture of the howler monkeys, though, because they were more than 100 feet above us at the top of a very tall tree. On the left is one of the famous temples (the spot where we stood to get the photo at the top of this page). 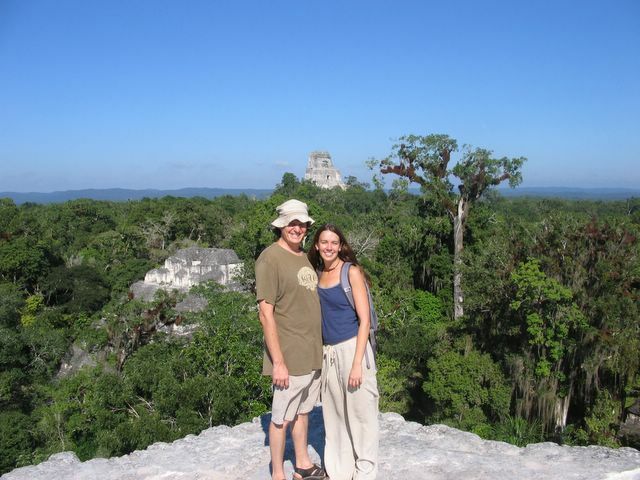 On the right is Rob standing on another temple that's still covered in earth, since it has not been excavated. 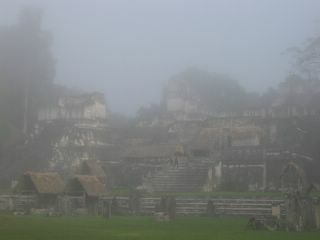 One of several acropolis-like structures (this one called the North Acropolis), in the early morning fog. The same North Acropolis around 11am the same day. The South Acropolis. Just behind it is a side view of the same temple shown in the picture at the top of this page. 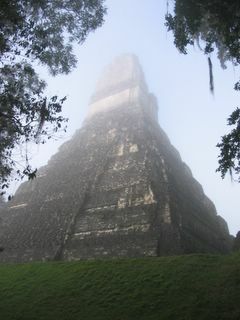 Another one of the large temples. 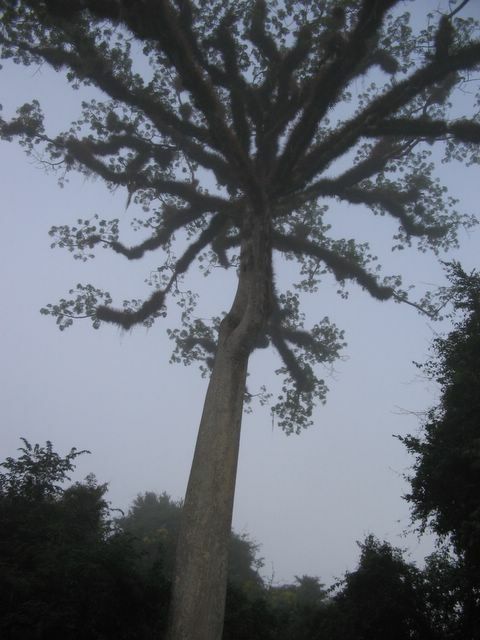 This one is still mostly unexcavated, but the top towers high over the trees. 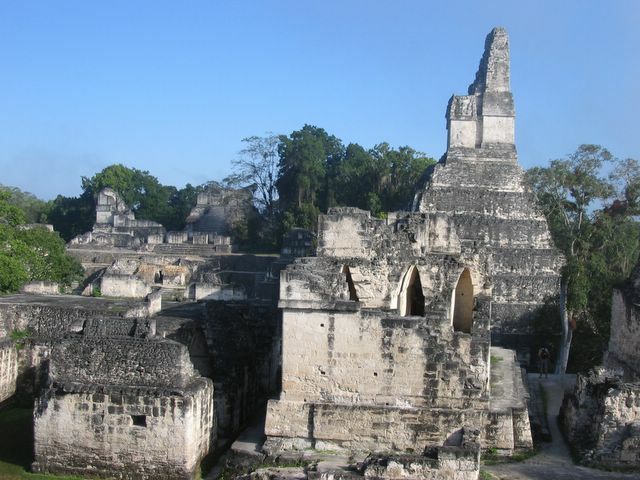 This pyramid is much older than most of the other temples at Tikal, from an earlier period in the city's history. 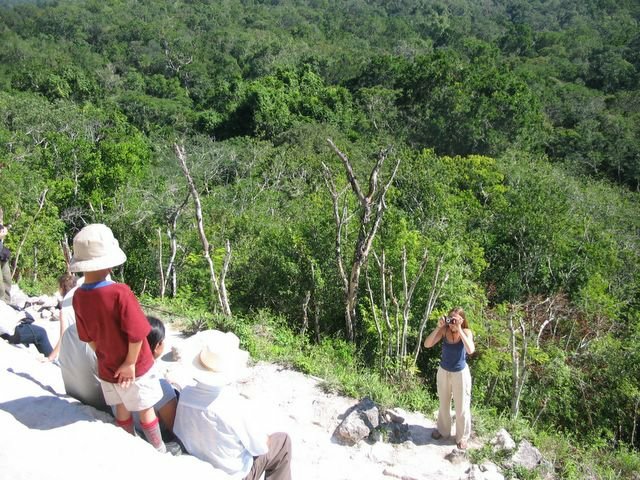 Though not as impressive to look at, it's much easier to climb and offers one of the best views of the site from the top. 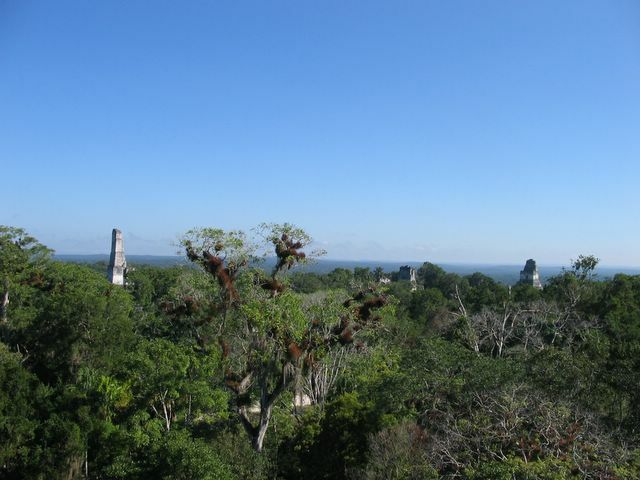 The view from the top of the Great Pyramid, looking over the treetops to the larger temples. The temple to the right is the one pictured in the photo at the top of this page. Another view from the top of the Great Pyramid. Carley takes a picture of a family of Mexican tourists. 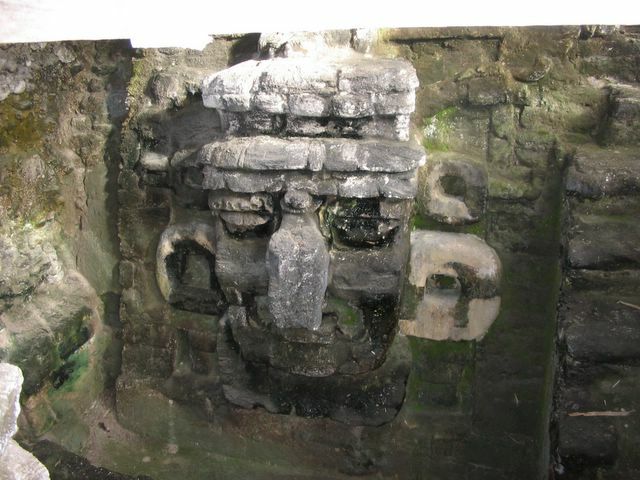 Unlike Copán, Tikal is not known for it's detailed artwork. This carved image is the most impressive and best-preserved one that we saw at the whole site.